EPS or Encapsulated Postscript is a graphics file format that can contain graphics, text and bitmap images. EPS files can be viewed using several popular applications like Adobe Photoshop, Adobe Illustrator, CorelDraw graphics suite etc. If you wish to convert your documents from PDF to EPS format, you can do it by using Icecream PDF Converter. This application has a user friendly interface and supports conversion of documents in a number of popular formats to and from PDF. Follow the instructions below to convert PDF to EPS format with ease and at no cost. In order to have this program at your service on your PC, first you should download Icecream PDF Converter from its official website. When the setup file is saved, run the installation of the software and follow all the steps guided by the installation wizard. As soon as this process is complete, open the program to initiate PDF to EPS conversion process. From the main window of the launched program select the “From PDF” option indicating that you would like to convert PDF files to other formats including EPS. To add the desired PDF files, hit the “Add PDF File” button to browse your computer with opened Windows Explorer and select the files. You can also drag and drop the files right to this window. You can later on add more files by pressing the PLUS button in the right upper part of the program's window. To preview the contents of any added PDF file, click on the magnifier icon beside the filename. To preview the content of a password-protected file, you are required to insert the valid password first. The default conversion format set by Icecream PDF Converter is JPG; you can see it indicated by the “To” column. To change this option for a selected file, click on its “To” value and select “eps” from the opened dropdown list. To set this value for all the PDF files, use the “JPG” hyperlink from the bottom of the window panel where the common settings for all the added files are. Program offers selection of exact pages of added files to be converted. To specify with which pages you wish to work with, click on the value of a file in the column “Pages”. In the opened panel of the program you can insert page ranges by entering their first and last pages. You can also define detached pages by entering its number into both “From” and “To” values. To remove added ranges or pages, click the “Clear” button: in this case all the pages of this file will be converted. 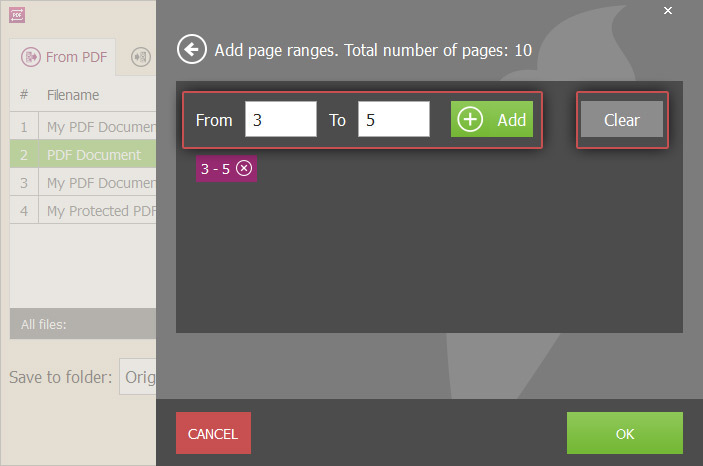 To split an added PDF file into separate pages during the conversion – tick the corresponding option next to it in the column “Split”. To split all the added documents into single pages tick the “Split all” option in the area of common settings in the bottom of the working area of the program. 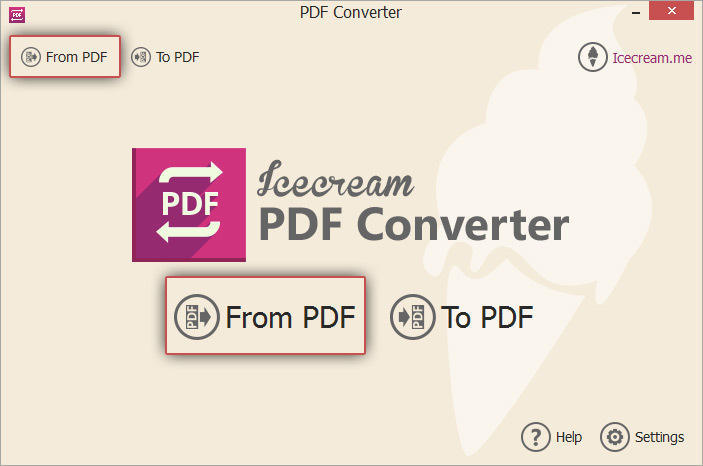 Icecream PDF Converter converts password-protected PDF files to other formats. When you add such a file, in the column “Password” you'll see a button “Enter” highlighted. As soon as you click it, a new window for inserting the password to unlock this document would appear. Note that if the password is incorrect or not inserted, the program will skip it during the conversion. To delete a file, click on the recycle bin icon beside it. To delete all files, click the “Clear All” button in the common settings area. “Save to Folder” section allows you to choose the target folder where the generated EPS files will be saved: Sub Folder (if this option is selected, a new sub-folder will be created under the folder containing the PDF file. The EPS files will be saved in this directory); Original Folder (if this option is selected, the EPS files will be saved in the same folder as the original PDF files); Select Folder (this option will allow you to browse your file system and select a folder of your choice). 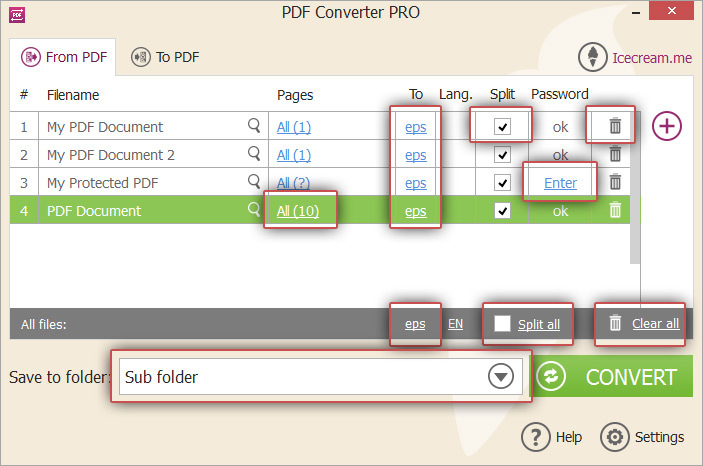 To convert PDF to EPS format, press the CONVERT button. A progress bar will display the current status of the conversion process with details like the elapsed time, the file number in the queue being converted etc. You can temporarily suspend the conversion process and resume later using the pause /resume buttons. To terminate the process, use the Cancel button. A confirmation message will appear after all files are converted, with an option “Open Folder” to open the folder containing the converted EPS files. 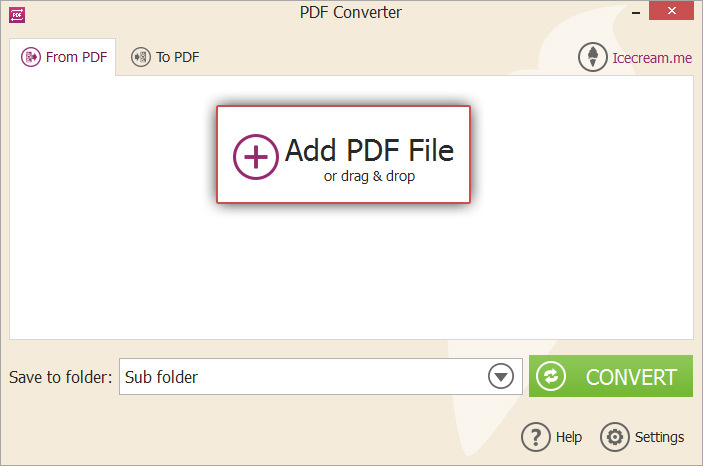 Here is how easily convert PDF to EPS with the help of Icecream PDF Converter.